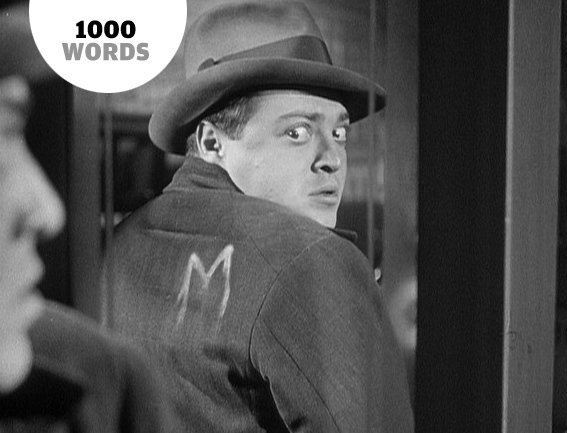 Fritz Lang’s 1931 masterpiece M, concerning the pursuit and capture of the Berlin child-killer Hans Beckert (memorably played by Peter Lorre), deserves to be regarded as a towering landmark of cinema and an important stylistic catalyst for a host of reasons. Along with the game-changing use of leitmotifs to associate a sound with a character, the superb expressionistic use of reflective surfaces to convey themes and meaning makes M one of cinema’s turning points. 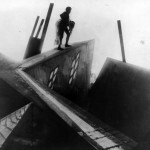 Lang’s use of windows and mirrors as a dramatic metaphor, a technique that can be found replicated in many movies right up to present day, brought a subtle power to his films and can be viewed as one of the bridges that link German Expressionist Cinema with film noir. Inspired by Lang, film-makers have frequently employed mirrors to indicate the ambivalent state of mind or double-crossing intentions of their characters, to suggest that they are harbouring ulterior motives, divided loyalties or split personalities. 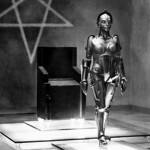 Lang maintained a long relationship with glass and mirrors throughout his career; he put them to inspired use as a tool of production (try googling ‘the Schüfftan process’ for more on this) to create some of the effects in Metropolis (1927), they feature heavily as more-than-meets-the-eye character indicators in his noirish Hollywood pictures (you’ll find countless examples in The Woman in the Window (1944), Scarlett Street (1945) and The Big Heat (1953) for starters), but it is in M, his first talkie, that they are used most effectively. 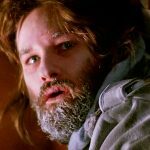 We see Beckert on numerous occasions reflected in domestic mirrors or shop windows and it is these moments that imply the character’s inner conflict. More than that though, there is a socio-cultural significance to the use of shop windows in this Weimar era German film; they are representative of the proliferation and display of the seductive commodity, and its representation in Lang’s films fits his thematics of desire and its frustration by the material forces of history and contemporary everyday life. In M the criminal underworld is clearly a reverse image of bourgeois society. At one point we see Beckert stood in front of a shop window looking at a display of knives. We cut between an inside-looking-out shot of him through the window perusing the goods and a reverse shot from Beckert’s subjective perspective noticing the reflection of a little girl. In the first shot we can see his head framed by the reflection of the knife display, a potent visual sign that he is trapped in his own desire. 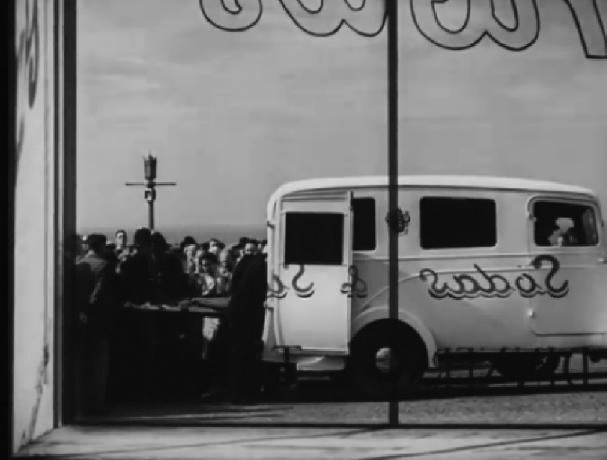 Later on, after he has been surreptitiously track-marked with a chalk ‘M’ on the back of his overcoat by one of his pursuers he catches sight of the letter reflected in the mirrored panel of another shop window, an image which has taken on iconic status. The letter ‘M’, being symmetrical, reads the same in reverse, so when Beckert sees the chalk character on his back he doesn’t have to work too hard to realise that he has been found out, branded and stigmatised. 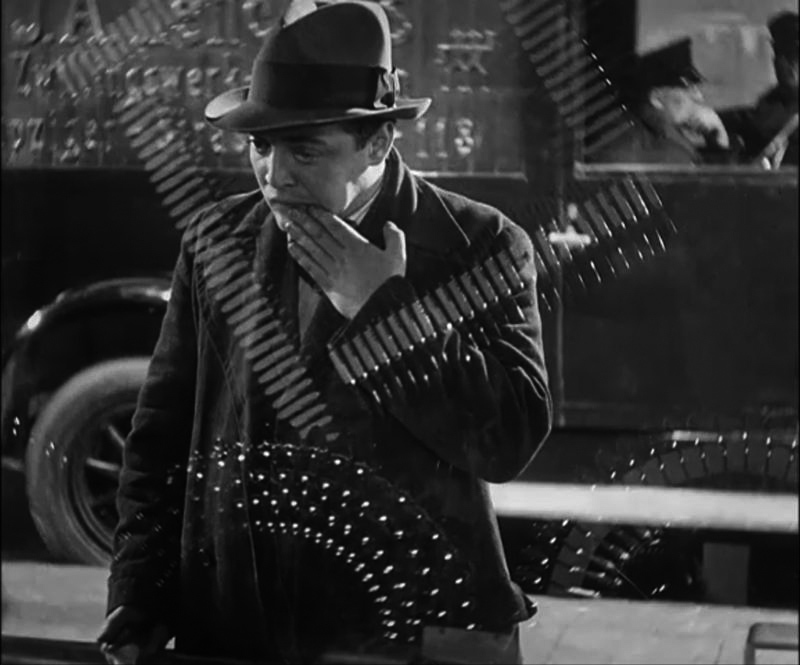 Thanks in good part to Lang’s preoccupation with reflection, the reversal of letters, either reflected in windows/mirrors or appearing on transparent surfaces and read backwards became a recurring feature in noir cinema’s efforts to communicate that all is not quite right with the world. 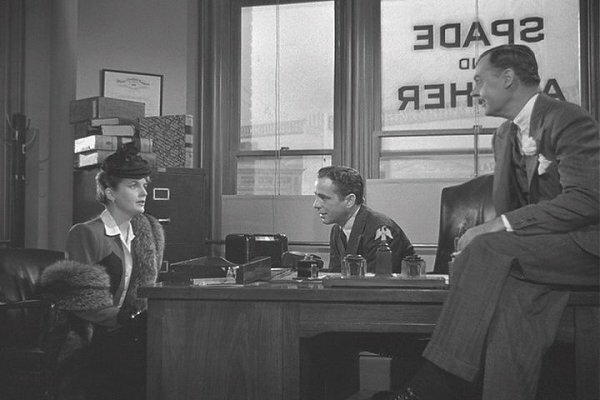 In The Maltese Falcon (John Huston 1941) there is an early establishing shot that involves a view of the window from the inside of the private detective’s office with the names ‘SPADE AND ARCHER’ seen in reverse. By opening with this typographic switcheroo Huston is letting us know that everything is not exactly as it seems and that either the partnership or the characters are less than pure and upstanding. The lettering reappears as shadows on the floor or walls in several subsequent scenes, reinforcing these motifs. Another instance appears in Charles Laughton’s masterful The Night of the Hunter (1955). The Spoons ice cream parlour in Cresap’s Landing is an early location that brings the murderous Reverence Harry Powell (Robert Mitchum) into contact with the townsfolk; it’s here that he gives his famous knuckle-wrestling ‘love versus hate’ sermon. We see the name of ‘Spoons’ emblazoned across the front window of the store and its owners Icey Spoon (Evelyn Varden) and her husband Walt (Don Beddoe) come to be characterised as nosy neighbours. When later we see them spying on Powell from their back room the top of the frame shows ‘Spoons’ on the window, reversed and readable as the word ‘snoops’. Spurious and coincidental? Maybe, but this was a film that put emphasis on letters; look no further than the LOVE and HATE tattoos on Powell’s hands. If nothing else it’s fun to try spotting these meaningful window words in movies and just occasionally one comes across a good one. If you went to see Steve McQueen’s Shame (2011) recently did you happen to notice anything finger-scrawled on the dirty window of the subway train just behind Brandon’s (Michael Fassbender) head?